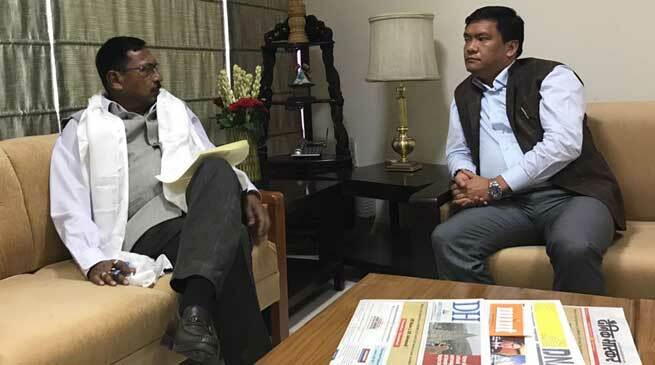 Chief Minister Pema Khandu who is in National Capital called on Union Minister of State for Railways Rajen Gohain today requested for railway corridor along the foothills to establish railway connectivity to the eastern part of the State with the rest of India. He proposed for seven rail links for Arunachal Pradesh. These rail links are Itakhola to Seijosa – 15.00 Km, Doomdooma to Wakro via Namsai to Chokham – 70.00 Km, Dangri to Roing – 52.00 Km, Naharkatia – Deomali – 20.00 Km, Simaluguri to Kanubari – 30.00 Km, Existing of Lekhapani –Miao Line to Deban, New Kamlang, Nampong, Jairampurand back to Lekhapani making a circular link – 75.00 Km, Rupai to ParshuramKund for urgent consideration of the Ministry of Railways. Khandu further requested that the frequency of the weekly train from Naharlagun to Delhi be increased to a daily train or suitable trains from Delhi – Guwahati be extended to Naharlagun. He also impressed upon for increase of the quota earmarked for Arunachal with to and fro journey. “It is pertinent to mention here that sanitation facilities at Naharlagun Railway Station needs to be augmented and the catering services be upgraded in the Express train to be brought at par with the Rajdhani Express. The deployment of manpower at Naharlagun Railway Station also needs to be enhanced. In the backdrop of many railway employees abstaining to join at Naharlagun Railway Station, provisions for taking State Government officials on deputation to Railways for general duties as well as security duties may be considered favourably. Similar arrangements may also made for Murakselek to Guwahati services” Khandu requested further. While informing that Guwahati is the main connecting hub for Arunachal Pradesh, CM requested to introduce a day train on the lines of Shatabdi to address the needs of the ever growing passengers besides, urging for a goods train from Guwahati to Naharlagun for movement of basic goods, construction materials and essential supplies. “On return, the agriculture produce of Arunachal Pradesh and Assam in that region can also easily reach the markets of India through Guwahati” he justified his request. Giving a patient hearing, the Union Minister assured all out support to Arunachal Pradesh. He assured that Shatabdi train would be started soon as requested while quota for Arunachal would also be increased. In respect of railway recruitments, the Union Minister said that a separate recruitment process for North East region is being worked out to address the manpower. While saying that the border state is on high agenda of the Railway ministry for providing rail connectivity, Gohain assured to take up the proposed new rail links on priority.